Termites are the most economically harmful wood-destroying insect in the US. Almost $2 billion per year is spent in trying to prevent and treat the damage they can do to your home. 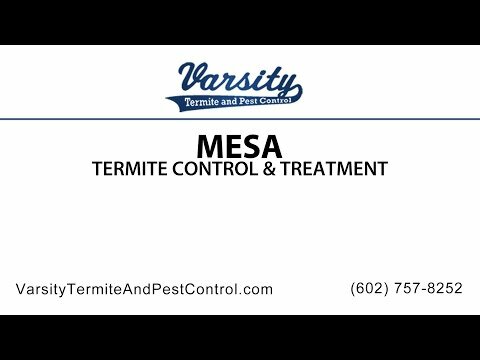 There are many cost effective options to prevent termite damage to your home and Varsity Termite Control in Mesa is just one of them. Termites need food to survive and the wood of your home is the best place for them to find it. In nature they feed on dead wood, including roots and stumps. Around homes they will readily feed on wood mulch used in landscaping, but best of all they like the moisture and protection that it provides from their natural predators (ants, birds, lizards, etc) that like to munch on them. In your home they often times will first attack wood that is located closest to the soil. As they feed they can tunnel through inedible materials such as foam insulation and plaster board as they search for the yummy wood of your homes framework. They may start at the base of your home but they can easily travel to the upper floors and destroy one of your most valuable assets. They need food (wood) and water for their survival and families in Mesa love the recommendations that Varsity Termite and Pest Control have below to keep these very unfriendly creatures from using your home as their food supply and nesting ground. Avoid or minimize the use of wood mulch next to the foundation of your home. Never store firewood, lumber or paper against the foundation or in the crawl space. Keep the crawl space of your home dry at all times. By employing these recommendations your can keep your home termite free. But if think you might have termites Varsity Termite and Pest Control is the best place to go to protect your home from further damage. By contacting Varsity Termite and Pest Control you can save yourself in many ways and prevent yourself and your home from getting any termites. If you have any questions or concerns regarding any termite control, we are here to help you. We’ll provide you with all the information and answers you are looking for and will need to know. Our other services also include pest control and scorpion control. Our teams of experienced termite control exterminators in Mesa are looking forward to helping you and keeping your home safe.